Phillip Ndowu | Banner | Grace Barnes, junior early childhood studies major, enjoys relaxing by reading a book on the Front Lawn or practicing her soccer skills. 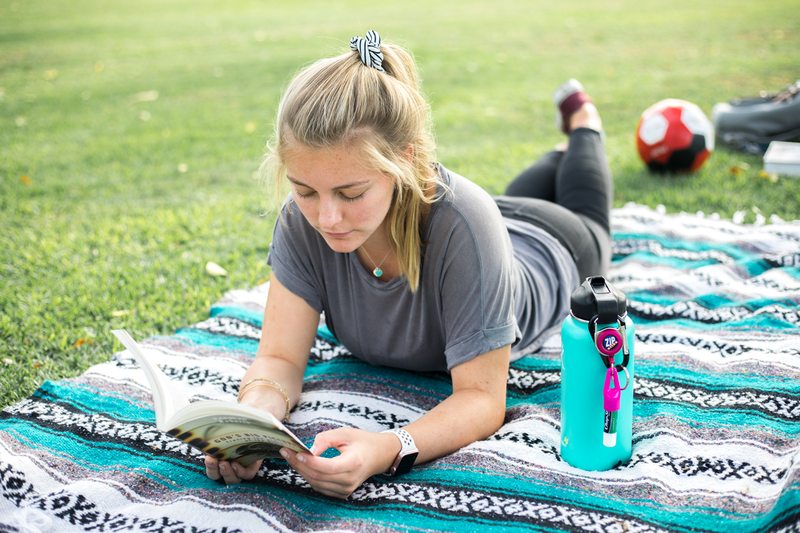 Students can follow her lead or try some other ways to balance out the stress of college life like taking a hike, hanging out with friends or doing some art. Whether you are a freshman or have a few years of experience as a senior, college life brings a new type of challenge. From classes to meetings, extracurricular school programs, jobs or internships and more, there is always something to do. Students cope with their demanding schedules in different ways. For some, taking time out of the day to spend with friends can be rewarding. For others, a quick, 30-minute study break in between classes does the job. Brina Russell, senior sociology major, said hanging out with friends and doing extracurricular activities helps her maintain a healthy balance between school, work and other aspects of life. Other activities, such as scrolling through social media, can be outlets for students to take a break but sometimes it can be more distracting than helpful. “I had to delete the Twitter app because it was (stopping) me from doing my homework,” Russell said. Fortunately, there are ways students can take a breather successfully without becoming distracted. California Baptist University’s Recreation Center has a variety of equipment and classes such as Zumba, deep stretch and cycling that are beneficial for relaxing and releasing stress in between classes. Emily Norris, junior nutrition and food sciences major, said she finds taking time out of the day to work out in between classes is a more suitable way for her to manage a busy class schedule. “I go to the gym whenever I can to destress and spend time away from school,“ Norris said. Dr. Kristin Mauldin, assistant professor of psychology, said physical activity can have positive effects on stress. It can be important for students to understand when it is time to destress so it does not interfere with his or her mental health during a busy semester. “I get so overwhelmed with everything that I have to do that I feel like I can’t take that time. That’s when I really need it the most,” Norris said. Mauldin said little changes, such as stretching or a nice walk outside to keep the brain from fixating on things, can help someone focus on the present. With finals just around the corner, it may be rewarding to take some time out of the day for a breather.